Crowded Wet Mushrooms. A Beautiful Thing. For best results, soak your mushrooms, then crowd them.... Really. We are all told not to wash our mushrooms because they will soak up water. One of the demos we do in the Harold McGee class is to disprove this myth by cooking two batches of mushrooms side by side: one that has been “brushed off” and one that has been soaked in water. The soaked mushrooms do take on water, but that water cooks off in the pan. We send the mushrooms out to the audience and they taste pretty much the same. As a bonus, washed mushrooms are a heck of a lot cleaner than brushed-off mushrooms. Myth busted –you can wash your mushrooms without worry (this part is not news to many of us). The problem with the demo has always been that we haven’t controlled the variables well. In particular, salt and oil levels were not kept the same from batch to batch. This time, we resolved to do better. We weighed out two identical batches of mushrooms. Half were brushed-off. Nils first sliced and then soaked the other half just so they would really soak up a bunch of water. To make the test really severe, I decided to cook the soaked mushrooms in one batch in an extremely crowded pan, and the dry mushrooms in 3 batches with plenty of room. We weighed out identical amounts of salt and oil (this is the crucial part) and began cooking. As we expected, the soaked crowded mushrooms formed a soupy mess in the pan. The dry mushrooms didn’t stew and cooked quickly. Here is where it got weird. The dry mushrooms ended up absorbing all the oil. In fact, I had underestimated the amount of oil they needed. They wanted more. I couldn’t add any more oil, however, because it would have ruined the experiment. When the soaked and crowded mushrooms had finally evaporated all their extra water and stated to sauté, they didn’t absorb all the oil. When they were finished, a significant amount of oil was left in the pan. They looked as good and tasted better and less oily than their dry cousins –by a lot. Our explanation: While the mushrooms are boiling off their water, they aren’t absorbing oil. By the time the boiling stops they have already collapsed, so they aren’t as porous as a raw mushroom and don’t want to absorb oil. The dry mushrooms start absorbing oil from the get-go. None of us had expected this result. Just goes to show what you can learn when you pay attention. P.S. I also added all the salt at the beginning of the cook, for whatever that’s worth. Now you’re REALLY knocking on some orthodoxy! How far into browning did you take the mushrooms? Were you trying to get to the same stage with both soaked and non-soaked batches? Was it possible? Also, have you tried the soak with other types of mushrooms? Might other varieties have different absorption tendencies? Alton Brown debunked that myth about 3 years ago in an episode of good eats. He also went on to test other golden rules – the oil in pasta water, searing meats to ‘seal in the juices’. Usually not a big Alton brown fan as he just seems to be a ‘lite’ version of McGee. Anyway, this particular episode was quite good and might provide some more techniques worth trying. I haven’t seen that episode. The searing thing is actually one of the first things McGee ever wrote about in the original version of On Food and Cooking. It traces back to a dude named Baron Justus Liebig. The thing about the mushroom myth is that we all just thought it didn’t matter whether you wash the mushrooms or crowd the pan. We didn’t think it was actually better to soak the mushrooms and crowd the pan. If I recall correctly, Alton Brown debunked the soaking, washing, vs brushing myth by weighing the mushroom prior to soaking, rinsing, and brushing. His experiment the mushrooms only absorbed 2 oz of water. If that’s not correct, well, it’s been three years. And Dave, how much salt? And, of course, would you consider brining the mushrooms? Brining is an interesting idea. A demo that Nils and I do is to inject flavors into mushrooms in a vacuum bag before we cook them. That works, so I guess brining would work as well. As you mentioned, brushing vs washing isn’t really news. Most of us have always washed our mushrooms (at least the cheap ones). We do that experiment in the class because it is an easy myth to disprove and plenty of people still believe it (We also do other myths). What is fun about the class is that as the teachers we can learn new things even when we are doing demos that we’ve done over and over –like the mushroom demo. For years we’ve been banging that demo out yet never paid close enough attention to what was going on to learn a valuable fact. It isn’t just a myth that you shouldn’t crowd the pan –crowding the pan is the best way to cook (in our opinion). Another alternative we haven’t tried yet is to steam the mushrooms first then saute. Could we trouble you to add a vacuum bag primer to the new years resolution. I’m looking for some guidance on how to work with this technique at home, particularly with eggplants. My grandmother used to salt them and put a towel with a weight on top of them before making the eggplant parm! Just so happens we addressed that very problem in one of our first posts: Eggplant. But we surely will add a sous-vide/low temperature primer to our list of to-dos. The searing myth was actually debunked by a French scientist back in the 1930s … but chefs weren’t paying attention to that kind of thing back then. I’ll try the mushroom comparison. I like the speed of browning with an uncrowded pan. And I don’t use much oil to begin with. Maybe the ability to do a ton in a single batch undoes the time disadvantage. Can’t thank you enough for all that you have and continue to share!! The wet mushrooms looked and tasted beter and had les oil absorbtion. They browned quite well once the liquid in the pan evaporated. I almost always use something similar to the wet method when cooking mushrooms. I add all of them to a pan with some salt (to help the water out), and then let the water boil off slowly. Not until all the water is gone I add the fat and brown the mushrooms. That gives a very intense flavour. Be prepared that the amount will shrink a lot though. What’s the time difference between the two? I suspect that one reason for the tradition is speed, since mushrooms are often part of finishing a dish a la minute along with a pan sauce. You guys should have at the “Confit Myth” (discussed here: http://forums.egullet.org/index.php?/topic/130474-confit-myth/). Nathan Myhrvold conducted an experiment on confit and basically concluded that the same results could be achieved steaming and then rubbing in fat post-cooking. Paying attention is the key isn’t it? I never thought of this but it makes perfect sense. I wonder if the same would be true with eggplant about cell collapse and oil absorption if the eggplant was salted and the bitter liquid released then resoaked and crowded into a pan. What say you? I was thinking about that. I suppose so. The only problem is that cooked eggplant is so fragile. The technique we use with eggplant is to crush it in a vacuum bag so it won’t absorb oil anymore. Full details here. Having seen Julie & Julia about 5 times (forced to, on aircraft), the only thing I remember from that otherwise delightful movie is “Don’t crowd the mushrooms!”. I think I’ll stick to blogs for cooking tips. Good to know! So, if you’re going to throw soaking wet shrooms into the pan, what exactly is the oil for? I use oil to better conduct heat to the uneven surface of the food. But if the shrooms will mostly cook by stewing in liquid, do you need it at all? Is there significant oil left for the sauté after the liquid evaporates? Or could you just dispense with it? I suppose you could use less oil, but it is there for good browing. My question is: were the pans hot when you sauteed them? I would never saute mushrooms in a cold pan, but if they’re wet, the more water there is, that would help keep them from sticking. Cold pan. As you say, lots o water, no sticking. It seems that to get the same color on the soaked batch they would have to cook longer…would this not cause a soggy shroom? They do take longer but they don’t get soggy. Very interesting discussion. In relation to brining, for a long time my favourite method of cooking mushrooms has been to poach them in milk with salt and pepper and a little butter. They turn out just stunning and very juicy and flavoursome. I’ve been cooking vegetables that need to be fried on a low heat with this method some time ago and it is great (all the common instructions on cooking fluid out with oil started to seem a bit odd, why not cook the liquid out first and then fry them). The only difference is I add some water, cook them and then add fat. Caramelised onions for example are far easier by first cooking them with some water and after they releases a lot of their liquid at a form of fat. A soffrito, the same story. Maybe an idea to test eggplants, the infamous oil sucking machines. We usually vacuum eggplants to squash them so they don’t absorb oil. The great thing about mushrooms is that the wet cooking cooks them down but doesn’t break them up. Mushrooms never get mushed up. I’m worried eggplants might break apart. In they vacuum they are great. I don’t quite follow your explanation as to why the mushrooms don’t absorb oil. It’s generally accepted that when a food item containing water is boiling off its moisture content, oil absorption is minimized, but in this case, the temperature should drop drastically if the pan is crowded with cold (depending on the temperature of the rinse water) or room-temp mushrooms. 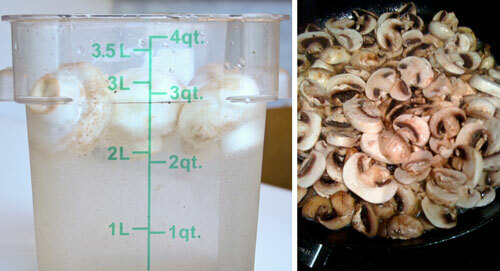 If anything, cooking fewer mushrooms at a time should result in less oil absorption due to higher average temp vs time. As you say, in a normal frying operation, high temperatures are needed to keep a positive outward movement of moisture which prevents the absorption of oil. Crowded pan mushrooms are a little different from ordinary frying. Mushrooms start out as relatively porous little sponges ready to soak up oil. In the case of high heat, uncrowded pan, apparently the outward movement of vaporizing water isn’t sufficient to prevent the absorption of oil before the mushroom compacts and loses porosity. In the case of cold start, crowded pan, it may be that some oil is absorbed into the spongy structure of the mushroom initially, but soon those mushrooms are literally swimming in their own juices. At the beginning of this period, the mushrooms have not compacted and are still sponge-like. Perhaps absorbed fat is washed out during this period. What I know is that by the time the liquid has evaporated, the mushrooms have compacted and aren’t in the mood to absorb much oil. The only thing I’ve got against washing mushrooms is that it really speeds up discoloration. Seems to happen in minutes. Any tips to stopping that? Hmm, Dunno ElSuerte, I haven’t worked on that problem.